Health disparities affect all of us from the perspectives of equity, economics, and quality of life. NIH defines health disparities research to include basic, clinical, and social sciences studies that focus on identifying, understanding, preventing, diagnosing, and treating health conditions such as diseases, disorders, and other conditions that are unique to, more serious, or more prevalent in subpopulations in socioeconomically disadvantaged (i.e., low education level, low income) and medically underserved, rural, and urban communities. The NIH Academy offers trainees the opportunity to learn about health disparities, enhance their knowledge of gaps in health outcomes, and investigate what is being done to address health disparity issues. The NIH Academy trains future researchers and physician scientists to actively engage in promoting a society in which all people live healthy lives and have equal access to health care. Postbacs can choose between two different NIH Academy Tracks 1) The NIH Academy Certificate Track and 2) The NIH Academy Fellows Track. Please click on the links to learn more about the Academy curriculum, the Academy Certificate , the Academy Fellows, and the NIH Academy Enrichment Program. Check out a table that compares these programs to each other and to the Postbac IRTA Program. All Postbaccalaureate Intramural Research Training Awardees (IRTAs) , Cancer Research Training Awardees (CRTAs) and Technical IRTA/CRTAs at the NIH are eligible to participate in the NIH Academy as are individuals who have accepted one of these positions. If you are not currently a Postbac IRTA but want to participate in the NIH Academy you should apply to both the NIH Postbac IRTA program and the NIH Academy. Please note that although you may apply to the program before you secure a postbac position, to participate you must have been offered and accepted a position by the start date of the program. Please take advantage of the Postbac applicant advice resources and FAQs. Reading all the information available will greatly increase your success of being accepted into the Postbaccaluareate IRTA program. 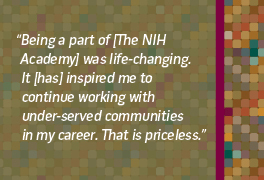 All trainees interested in the NIH Academy must submit a letter of interest for acceptance. It is best to highlight your interest in health disparities and any experience that you've had or experience that you would like to acquire. We would also like to hear about how health disparities may fit into your career goals. You are encouraged to inform us of which program you are interested in and why. Lastly, please provide information regarding research that you have done in the past and/or are currently working on (this research experience does not have to be related to health disparities). The NIH Academy Application for the 2019-2020 program will open in May 2019. Download the NIH Academy flyer.